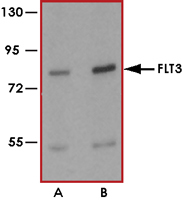 Sample Data :Western blot analysis of FLT3 in 3T3 cell lysate with FLT3 antibody at (A) 1 and (B)2 ug/ml. Scientific Background :FLT3 is a receptor tyrosine kinase that has been shown to play a role in proliferation and survival of hematopoietic progenitor cells as well as differentiation of early B lymphoid progenitors (1). FLT3 consists of an extracellular domain composed of five immunoglobulin-like domains, one transmembrane region, and a cytoplasmic kinase domain split into two parts by a kinase-insert domain. FLT3 is the most frequently mutated gene in cases of acute myelogenous leukemia (AML). About 30 to 35% of patients have either internal tandem duplications (ITDs) in the juxtamembrane domain or mutations in the activating loop of FLT3 (2). The consequence of either FLT3-ITD or activating loop mutations is the constitutive activation of the tyrosine kinase activity. 1. Christensen, J L. et al : Flk-2 is a marker in hematopoietic stem cell differentiation: a simple method to isolate long-term stem cells. Proc. Nat. Acad. Sci. 98: 14541-14546, 2001. 2. Gilliland, D G. et al: Role of FLT3 in leukemia. Curr Opin Hematol. 2002 Jul; 9(4):274-81.